KATHMANDU, July 01 : Speakers at a programme in the capital city have said the relations between Nepal and Canada should be strengthened to boost Nepal's visibility in the international arena. 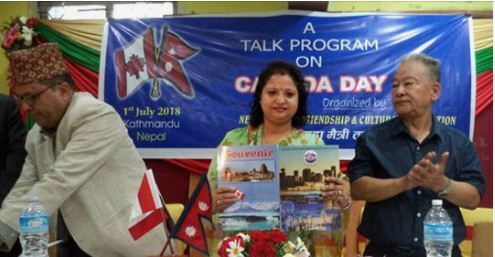 At a programme organized by Nepal-Canada Friendship Society on the occasion of the 151st Canada National Day here today, Deputy Mayor of Kathmandu Metropolitan City, Hari Prava Khadgi, said Nepal-Canada relations could be boosted by promoting the Society as a sister organization. On the occasion, former ambassador Hiranya Lal Shrestha said Nepal could take benefits from Canada.Society Chair Prof Dr Pradip Kumar Khadka mentioned that the Society was working untiringly for boosting Nepal-Canada relations. Dr Rita Dangol, who has been living in Canada for long, opined that if Nepal was made visible in Canada, it could help prop up Nepal's tourism. "In Canada, people are taught that Buddha was born in India, so, true information must be spread about it," she asserted.